While there was plenty of interesting topics presented during Nintendo’s E3 Press Conference, one game that particularly stuck out to me was the team-based first-person-shooter, Splatoon. The announcement and reveal of Splatoon for the Wii U was just presented to the world earlier this morning. What nicely sets the game apart from any traditional FPS is its system of ground control, team work, and options for strategy. 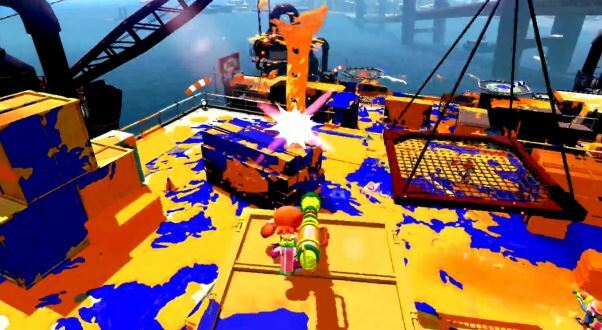 As opposed to players running around playing as soldiers with machine guns, they will be able to control squid-like humanoid creatures and wield large water-guns that spray out ink that is colored to the player’s respective team. Matches in Splatoon feature a four-on-four format and are held in closed battlefields or arenas which house plenty platforms, ramps, stairs, and corridors for maneuvering. Each team has their own ink color, and said color must be sprayed over as much territory as possible within a certain time-limit to earn a victory. Not only does spraying ink get your team closer to victory by claiming map-area, but it can be used for tactical advantage. To elaborate, players are able to transform into a squid state and travel quickly inside the puddles (or pool) of their team’s colored ink. Additionally, the ink can be used for more advanced maneuvers. For example, if a player sprays a wall and is covered in their team’s ink color, they are able to go full-on squid-mode and travel up the wall via the ink. Players are also able to glide under obstacles via their ink and can even become nearly invisible to enemy players should they stay still and hide in their ink. Of course, the enemy team’s ink plays a factor here. If a player is sprayed by the enemy team’s ink, they will die and respawn. Going further, if a player tries to travel in enemy ink, they will be heavily slowed down and become pretty vulnerable. Using ink on the battlefield can essentially be both an offensive and defensive tactic. Splatoon itself certainly caught my optic, and looks very easy on the eyes in general. Watching the gameplay reminded me of how bright and vibrant shooters like PvZ Garden Warfare can be. Apparently, players will be able to enjoy this bright colored game by having the choice of either using the gamepad’s control sticks or can utilize motion controls for moving, aiming, and even camera movement. Either way, players will need to make most use of strategy and take advantage of the accessible map which displays how much of the battlefield has been inked by both teams. As I observed others playing the game, I noticed there would usually be one player who stays back near the spawn to assure that the team would have that ground covered (using “covered” as a double entendre) throughout the match. Also, one tactic that caught my interest was having one team member spray down a path of ink from above the main battlefield so the other team members could advance. Not to mention, some form of additional ink weapons will be featured in the game for the team to cover ground or advance with, such as a sniper-weapon and a large paint-roller that would normally be used in real life for painting walls of a room. For a short glimpse in the trailer/reveal, there appeared to be a large target reticle being moved along the map and a large ink explosion was shown to follow. What resulted was as if there were a mushroom-cloud of ink! So, expect to see a few super-weapons too! With all matters considered, Splatoon looks like a lot of fun. If I were to play it, I would be that player sneaking around in the ink, waiting for the perfect opportunity to launch my ambush. Feel free to check my source and watch the full reveal starting at 35:00. Also, feel free to watch the E3 trailer for Splatoon below.